How did the ancient collision of India and Asia affect the evolution of the dragon lizards found all over the region today? New research delves into how bygone Asian dragons once invaded an independent India. Twenty-five million years ago, the Indian tectonic plate collided with the Eurasian continent. The collision —the culmination of a 100 million year journey after India split from the Gondwanaland super-continent—had an outsize impact on the region. It reshaped the geology of south-east Asia, with the creation of the Himalayan Mountains just the most notable effect. The impact was not just geological: the mixing of two very different groups of plants and animals, separated for hundreds of millions of years, had dramatic effects on the evolution of life in the region. The traditional view was that post-collision change primarily resulted from the invasion of Eurasia by species that evolved on the Indian subcontinent—a view supported by the presence of many Gondwanan lineages in modern tropical Asia. More recently, a number of studies have suggested that a flow of species in the opposite direction, from Asia to India, had an equally significant impact on the origins of many modern Indian lineages. Amidst such tangled evolutionary relationships, unravelling the origins of modern groups in the region continues to prove challenging. The Draconinae, commonly known as dragon lizards, are a large subfamily of almost 200 species that today range widely over Southeast Asia. Their origins, like those of so many groups in the region, remain unclear. Two previous studies were unable to provide a clear answer as to how the Indian-Eurasian collision affected the group. These studies, one a 1980 PhD thesis by S.M Moody, the other published by Macey et al. in 2000, had to work with limited data and, while they broadly supported a Eurasian origin of dragon lizards, exactly how and when they invaded India remained unclear. Since these earlier studies, new Draconinae species (and indeed whole genera) have been discovered and the first samples collected from several rare species. Armed with this new data, and benefiting from recent advances in DNA sequencing techniques, a new group of researchers, led by Jesse Grismer and Rafe Brown at the University of Kansas, have taken a fresh look at Draconinae evolution. Their study, recently published in BMC Evolutionary Biology, reinterprets the biogeographic origins of both Indian and Southeast Asian draconine lineages and provides the best answer yet to the question of how these dragons originated. The combination of unprecedented sampling and new genetic markers proved successful in resolving many previously problematic evolutionary relationships among Draconinae species. 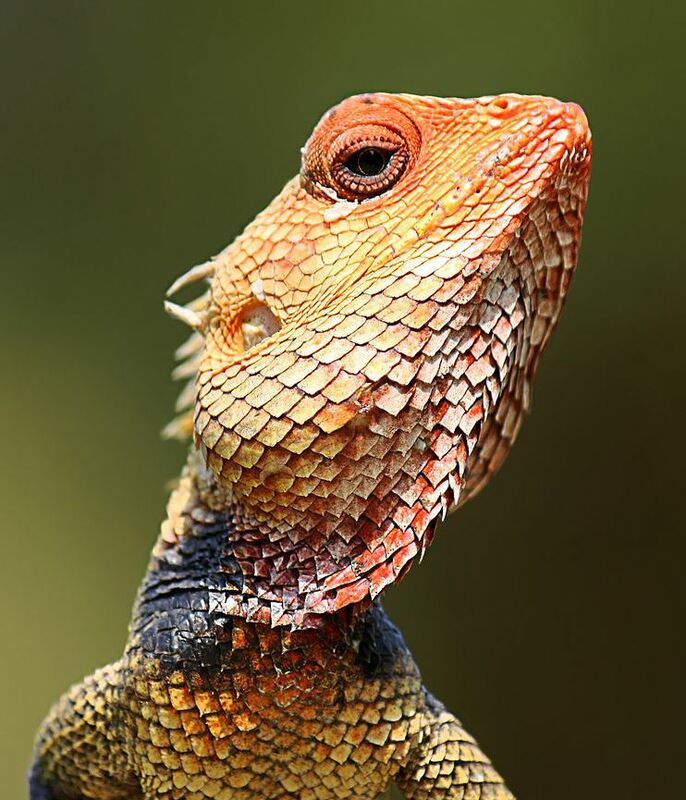 The results confirm a Southeast Asian origin of Indian dragon lizards and suggest that Asian species invaded India through two distinct colonisations. Perhaps more surprisingly, the results suggest that these colonisations occurred before the final collision between India and Asia. While this occurred approximately 25 million years ago, both lizard invasions took place during the preceding Eocene geological period (34-56 million years ago). 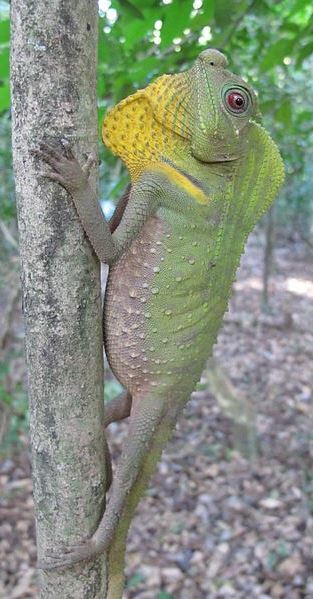 While the more recent Macey study had suggested a post-collision origin for Indian lizards, this pre-collision hypothesis was predicted by Moody in his original 1980 work on this group; 35 years later, modern-day techniques now support this theory. The first invasion of dragon lizards from Asia to India happened approximately 50-55 million years ago, the results of which are today represented by the genus Salea, found only in India. The second invasion then occurred in the middle Eocene (around 35-50 million years ago) and eventually resulted in the fan-throated lizards and Otocryptis; again, both genera today found only in India. Previous research proposed that land bridges existed between Asia and the approaching Indian subcontinent during the Eocene period. Grismer et al. suggest that such land bridges provide the best explanation for how Asian dragon lizards were twice able to invade India while it was still a separate landmass (see maps). Figure from the paper showing the researcher’s hypothesised land bridges that allowed the two dispersal events between Asian and India. This adds to a growing body of work suggesting that an exchange between India and Eurasia of many plants and animals occurred during the Eocene, before the ‘hard collision’ of the two land masses some tens of million years later. The ecology of many of these species – specifically that they don’t like getting wet – makes over-water dispersal events unlikely. Instead Grismer et al. suggest that land bridges between Asia and India existed for much of the Eocene, leading to broad scale patterns of faunal exchanges. They term this idea the “Eocene Exchange Hypothesis” and suggest it could account for the substantial disagreements over Indian vs. Asian origins of many modern groups; that is, focusing on events after the collision has blinded us to the importance of interchange of species between the continents before the collision. While the thunderous impact of India into Asia undoubtedly caused transformations that still echo today, some of the most important developments may have occurred while India was still on its silent approach through the sea. 2016 BMC Ecology Image Competition: Now accepting entries!